Description: Early copper-engraved map of Cuba, one of the earliest available maps of the island. Jamaica and Haiti also appear. 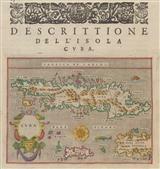 Description: Miniature map of Cuba with an ornate woodblock header and italian descriptive text below and on the verso. Coloured. 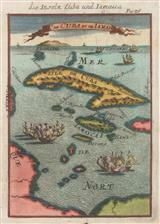 Description: A hand coloured miniature map of Cuba and Jamaica. Title: : Von Cuba, &c.
Description: Cuba, Hispaniola, Jamaica, Puerto Rico, and the Island of Santa Margareta. Coloured. 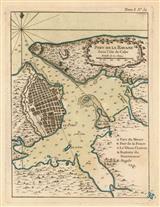 Description: A beautiful chart of the island with an ornate cartouche. A nice dark black and white impression. Description: Cuba. Also shows Bahamas and Jamaica. Embellished with ships. Coloured. Description: RARE sea chart of Cuba with the Bahamas and Southern Florida. Inset of Havanna Harbour. 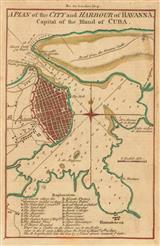 Description: Map of Havana with an accompanying key and description. Coloured. 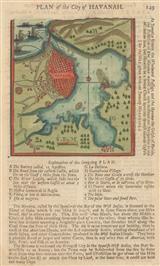 Title: : A Plan of the Siege of the Havana, drawn by an Officer on the spot, 1762. Description: The Battle of Havana (1762). A military action from March to August 1762, as part of the Seven Years' War. British forces besieged and captured the city of Havana, which was an important Spanish Naval base in The Caribbean. Good impression. Description: Bay of Havanna. Coloured chart of the Bay with insets of the Fort and Castle. Description: Havana. Plan of the city and harbour. Coloured. Description: Chart of Havanna Harbour with key to its defences. Original colour. Description: Cuba and the Bahama Banks. Coloured.